We had another office visit today. We usually see one of two doctors in the practice, and while we do like them both and think highly of them both, they do not agree on the way the will perform the c-section. They each have valid reasons, and they are both very qualified, wonderful doctors. We find ourselves confused and not sure what is best. One of the doctors thinks it is best to do a classical incision, and the other thinks it will be best to do a transverse incision. I will not go into all the reasons each has for their theory, but they are sound and well thought-out. It is hard on us that they do not agree with eachother. We just want what is best for the boys and for my health, as well as protecting my uterus for future pregnancies. We also learned today about the exact medicines I was given during the c-section with Billie,and found what likely caused me to forget the first 6 hours after her birth. We are so glad the doctor was able to figure that out for us, and that can be off of our minds now. We were so worried since it is likely we will only have a short time with our boys, I can not afford to forget even a second of their lives. Every minute we have with them will be so precious to us, and I feel so much better after our visit today. 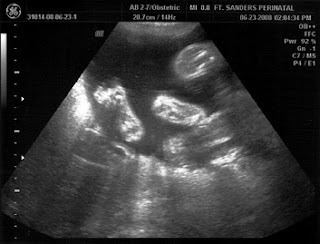 We got to see the boys on ultrasound today, and they are turned sideways with their heads on the left of my belly and their feet on the right. Their heartbeat is strong, and they looked sweet and adorable. We know they are active and strong by their kicks, but it is always comforting to see them and to hear their heartbeat. We do have some new pics to share, and I will try to get them posted over the next couple of days. Thank you all for your prayers and your support. It is amazing to us that we have made it to 32 weeks, but we know it would not be possible with out God and your prayers have helped us get here. Sorry I haven't updated in a few days. Everything is fine. My cousin Kelly is here from Virginia and it has been so nice to visit with her. I have enjoyed our time together, and it has helped me to not be so bored. We did have a doctor appointment Monday and it went well. Nothing has changed, we got to see the boys on the ultrasound and hear their heartbeat. We got adorable pictures of their feet and legs, too. My stomach grew quite a bit, 4cm in 1 week! My blood pressure was fine and so was everything else. It was a very successful visit, if uneventful, which is so nice for a change. We felt like normal pregnant people. We finally got the pictures back for the nursery, they were purchased by Matt in Africa and we had them stretched and completely designed the nursery around them, so it is so nice to finally see them finished and in the room. I will post a new picture of the room once we get them hung. We hope you enjoy the pictures here of the boys that we got on Monday. Matt requested them, since we did not really have any of their feet. They look so perfect, if not a little short! That has been our running joke over the past few weeks. The boys heads are normal for gestation, but their large bones in their legs and arms are about 2 weeks short. Nothing to be very alarmed about at all, but we got a kick out of it and feel it is completely normal for our boys to be short, they just take after their Daddy. Matt is very proud! We have had an exciting few days here. Evan, Matt's little brother from Atlanta, came up for a visit. I am sure he was more than a little bored, but he didn't complain one time. We did take him swimming one day and we all went to a movie last night. Of course, I was miserable. I just can not breathe sitting up, so they were all worried about me. Way to ruin a good time. Needless to say, I will not be attending any more movies until after the babies are born. The movie was good, Billie loved it and we all laughed a lot. It has been so good to spend time with Evan, he has joined the Marines and goes to basic training in July so we do not know when we will get to see him again. My cousin Kelly comes in today from Virginia to see us. We are so excited to spend time with her! We usually only get to see her at the most once a year, and it has been a year since we were last together. She has the coolest job ever; she is a Crime Scene Investigator and I love to sit and talk to her about her job. Billie just adores Kelly, so she is very excited for her visit, as well. Matt has only heard about her, so I am sure it will be nice for he and Kelly to get to know each other. I am excited for the two of them to finally meet, for sure. We both woke up this morning thanking God that tomorrow we will be 31 weeks. We didn't even think we would make it this far 11 weeks ago when we found out about Joshua and Caleb. 31 weeks seems like a huge milestone to us, and we feel so blessed to have made it this far. We still want to make it to 38 weeks, of course, but we will be ok with anything past 35 weeks. That is only 4 weeks away! I just know as of this morning that we will make it that far. I am very hopeful today that the boys will survive after birth, even more so than I have been. I am still terrified of all the unknown we will be facing, but I have a huge spark of hope inside my heart, a true blessing from God that is so real I can feel it. He has put us on the right path, put us at the right hospitals with the right people to take care of all of us. I am strengthened today and very hopeful. This is a good place to be. We met yesterday with some of the doctors and nurses that will be in charge of caring for our boys after their birth. We left the hospital yesterday so uplifted and blessed. We feel we are in such good hands and that our babies will be receiving such good, loving care. They have been planning for our delivery and will continue to do so until the big day. We are even more hopeful now. Our prayer is that they get to take care of our babies and help us learn how to care for them and help prepare us to bring them home. I will have a specific prayer request in the next day or two after I get all of the names of the nurses, so look for that soon. They have nurses that have volunteered to care for Joshua and Caleb so that we can get to know them and have certain familiar faces that we will see once the babies are here. That has touched us both so much. They are also thinking of ways to help Billie understand what is happening and help introduce her to her brothers and calm her fears. We are very blessed to be close to this hospital and have these amazing people on our team. We will be praying for them as they prepare to care for Joshua and Caleb. None of us know yet how challenging that might be, but I am not worried about that now. I know our boys will be in very good hands. God continues to be with us every step of the way and is blessing us with very skilled, knowledgeable, loving and caring doctors and nurses to take care of me and the babies. I am also feeling much better. I was having lots of contractions and lots of pain, but that has almost completely stopped. I have at most 6 contractions a day now. This has eased my worries so much. Even though my cervix had not changed, every time I started having contractions I would get so worried and stressed out. That probably only made them worse,but I couldn't help it. I am sure it is prayers answered and that is why they have stopped. I am just so very thankful. I am still taking it easy, though. We still want to get to 38 weeks. We want to thank everyone again for signing our guest book. They continue to make us stronger and make us smile. Thank you all for your prayers and words of encouragement. We had a good doctor visit yesterday. Even though I have had more "strange" pains and contractions, my cervix is still fine. That was such good news to hear. The doctor sat with us for a very long time and we discussed possible delivery options. 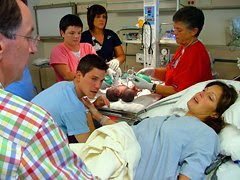 Basically, we will not really know what kind of c-section they will need to do until the time comes, but they will be cutting me vertically, that way they will have all the room they need and once they get to my uterus and see what exactly it looks like, they can decide from there which is the best way to get the babies out. So I will have a vertical incision on the outside, but not necessarily on my uterus. They will do an ultrasound right before surgery to see where exactly my placenta is and the position the boys are in, too. As far as dates go, we do not know that either. The goal now is to treat this like any other twin pregnancy, which means deliver at 38 weeks. That all depends on how big the babies get, how I hold up and how my body holds up. If we go into labor, we will try to stop it, but probably not if it happens after 35 weeks. We both felt better after talking with our doctor yesterday, we are all on the same page now. We were both so relieved after leaving there yesterday. There were so many questions on our minds and hearts walking into the office yesterday, and all of them were addressed and answered to best of their ability. We were much more relaxed and comfortable with our situation last night, for sure. Matt is hard at work again today, and Billie and I are just taking it easy together. We have read some books, played tic-tac-toe and watched movies together. We are waiting for her new bunk bed to be delivered today, which is very exciting for all of us. My mom will be over in a little while to take me to the dentist to get my teeth cleaned since I am not driving and Matt has to work. Those of you who know me know that I am terrified of the dentist and would rather do just about anything else than go to the dentist. Luckily, it is just a cleaning, so it shouldn't be too bad. I will just be glad to get it over with for the next 6 months. I really love all of the people in the office, and they know how scared I get. I even get nervous taking Billie to her dentist! I try to not let on with her about my fears though, because I do not want her to be afraid like me. We want to again thank everyone for signing our guest book and sending the emails of encouragement to us. We look so forward to sitting down together and reading them. It is really the highlight of our evenings. We are so lifted up by every one's prayers and we still feel God with us every step we take. God knows what we need, and he will provide it for us. Of that we have no doubt. Even though we do not know how all of this will turn out, we know that God has a plan for our family. We are so blessed to have each other and Billie and our wonderful family and friends. No matter what happens, we will always count our blessings and praise God for what he has done for us. Happy Father's Day to all the Dads out there. We want to first thank everyone that has signed the guestbook. We have spent the last two days watching and reading as the posts have come in. It has kept our spirits up and put smiles on our faces. We really enjoy them. I don't think I can relay to you how tender they are to us. I have had a lot contractions today and they started early this morning. I really can not stand up with out them starting and coming very regular. It is so scary for us, but we know it doesn't really mean anything as long as my cervix doesn't change and my water doesn't break. 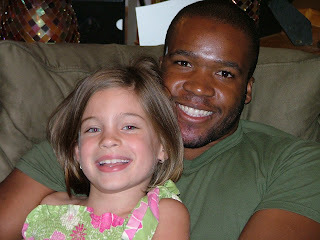 As sweet as it would be to have a Father's Day baby, we are definately not ready for that. We are 30 weeks as of today, so we are gettig closer, but not close enough! My goal is still 35 weeks, so I am going to do everything I can to make that happen. Matt is taking very good care of us, he has worked so hard to do that. He made us blueberry waffles for breakfast that were delicious. Billie made him cards at school and was so proud to give them to him first thing this morning. I didn't even remind her. She woke up on her own and came skipping into the living room holding her card and saying "Happy Father's Day!" It was so precious. She made those cards the last week of school, so she has hid them in her room for over 3 weeks now. We all enjoyed our breakfast together. Maybe the boys will have heads full of hair since heartburn has set in and will not go away! I had heartburn bad with Billie towards the end, I can't remember exactly when it started, and she had the biggest head full of hair of any baby I have ever seen! I will be 30 weeks on Sunday.It is nice to have a regular pregnancy problem, so I guess I am going to thank God for that, for heartburn. I did have some contractions tonight and was forced to take another Brethine. I am so thankful to have them, though. Part of me wonders if it is in my head that it makes them stop, guess it doesn't matter as long as they stop! Every morning I wake up I am so thankful that I made it another day. Another day closer to giving our boys a chance. We do realize there is a good possibility our boys will not survive their first day of life, but we want to give them every opportunity we can. We have made it this far, which is further than most people with conjoined twins make it, so that is something. The boys kick and kick so hard all day long, and it always makes me feel like they are strong, stronger than any of the doctors think they are. I pray they are, and a big part of me believes they are. We had a doctor appointment on Monday. I had been feeling some contractions, but thought most of it was really in my head. They hooked me up to a monitor and sure enough, I was indeed having contractions. They were 3 minutes apart. They gave me a shot of brethine and in 20 minutes, the contractions stopped. They sent us home with a prescription and I had to take one Tuesday night and Wednesday night. We know we want to wait to have these babies at least until 34-35 weeks. The contractions stress us both out, but we are thankful for the brethine that does stop them. The good news is that so far my cervix is not changing, I was dilated to 1, but no other changes. If we can just keep my cervix from changing and keep my water from breaking, we will be ok. I am now spending most of my time on the couch, and poor Matt is forced to completely run the house. He takes such good care of us all, and never complains. He is keeping long hours, though, trying to keep up with work and taking care of us, and I do worry about his health and stress level. Our next appointment is Monday morning and we are looking forward to sitting down with the doctor and learning more about what other steps there are to stopping early labor, and to what levels they will go to in our situation. As of today, we have decided to deliver in our home town, where our family support group is. We are much more comfortable with our doctors after sitting down with them on Monday. We still do not know when that date will be, but we are hoping for 34 -35 weeks, which will put us at around July 13. 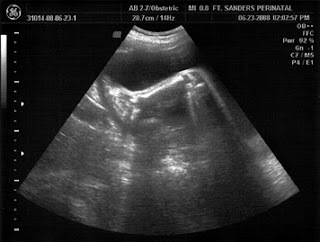 We will get an ultrasound every week and just take it week-by-week for now. There is always the chance that I will go into labor before then, but I am taking very good care of myself and resting as much as possible. I am probably fooling myself that I have any control over that at all, but at least it will give me something to work at! God is in total control of all of this, as he has been from the beginning. I pray for his will, but I still want a chance to hold our boys and love them for a while. I can't give up hope for my precious babies.